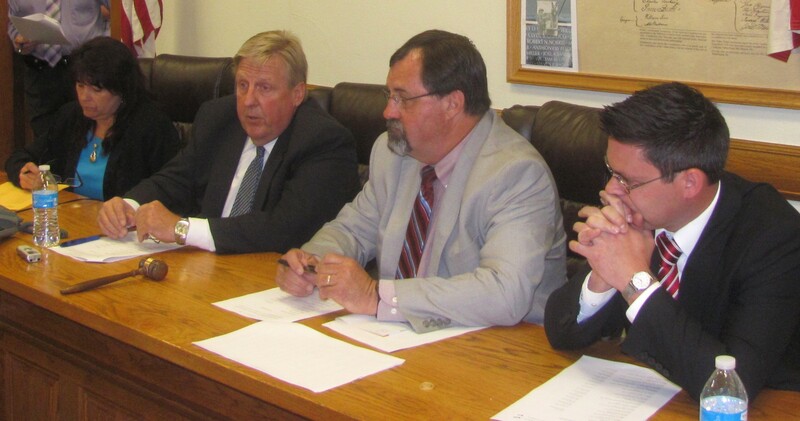 A public meeting of the Bradford County Commissioners (top) followed a closed-door meeting comprised of the commissioners, heads of local chambers of commerce and museum directors on June 11. An agenda bloated with new hires, transfers, promotions and their respective salaries was upstaged by an exchange between Prothonotary Sally Vaughn (above) and the commissioners concerning several issues affecting Vaughn’s office and citizens seeking passports. 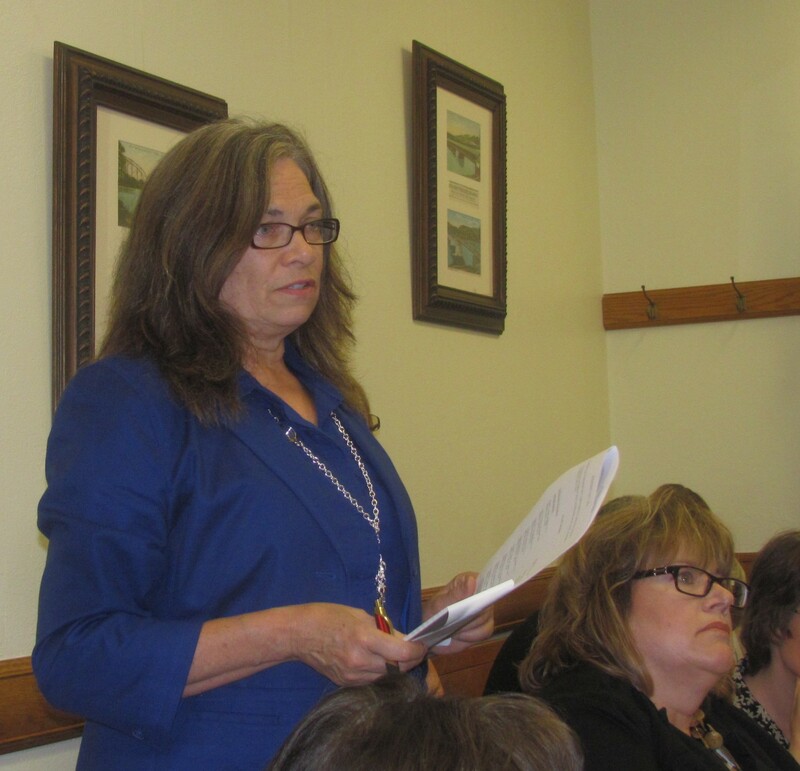 Vaughn asked the commissioners when a reported $50 per hour study of the operations of her office ordered last October would be completed, as she would like to replace a full-time employee who was forced to retire due to brain cancer. Commissioner Doug McLinko said that the study was ordered due to what the board viewed as a “glaring budget” that he contends is almost twice as high as that of Lycoming County which has a larger work load. “We just want to have a person back for the one that we’ve had for 10 years,” said Vaughn, who related later that hers is not the only budget that has crested in recent years for various reasons. Vaughn explained that, due to loss of a full-time staff member, her office stopped issuing passports in February. McLinko referred to the move as a mere tactic. “You’re trying to hold passports hostage in order to hire more people,” he charged. There were several references to Linda Schaite of the Federal Passport Agency in Philadelphia, whom McLinko said had been unnecessarily put in the middle of the ongoing struggles between the Prothonotary’s and Commissioners’ offices. “Quite frankly, it was very unprofessional…what she was thrown into,” McLinko stated. Vaughn maintains that Schaidt called her and asked how her department was doing and inquired as to whether or not Vaughn expected that her office would soon be in a position to issue passports again. McLinko referred to “several” conversation that he had with Schaidt and said that everyone was in agreement that access to passports is very important to the citizens of Bradford County. He reportedly told Schaidt that the Commissioners Office itself might elect to issue passports, instead of the Prothonotary office. “I think that’s a wonderful idea,” Vaughn told the commissioners. “I’m sure that they can do that. We have the cameras and everything else to get them started,” Vaughn said after the meeting. In reference to McLinko’s assertions, Vaughn stated. Later that afternoon, after a discussion with Schaidt, Vaughn drafted a letter to her relating the Commissioners’ intentions and announcing that the Prothonotary office was permanently discontinuing the issuance of passports. “I’m trying to be professional and respectful to the passport agency and the citizens,” Vaughn remarked.